Kadi Pajupuu (concept and weaving tools), Marilyn Piirsalu (video and weaving). Installation with video. 2017. Our work is about identity of a weaver. 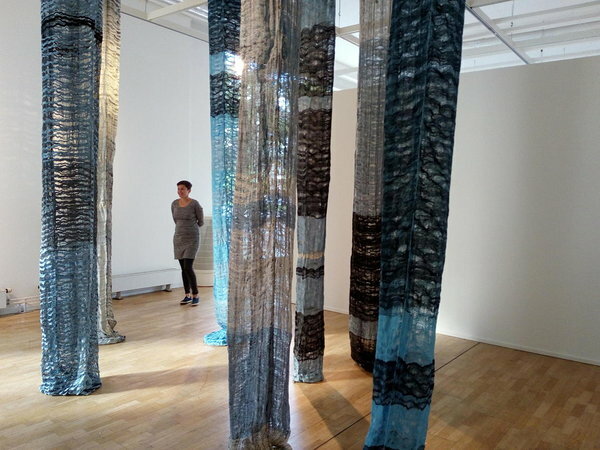 7 Waterfalls are seven handwoven double weave tubes that rise towards the ceiling. The viewer can walk between the waterfalls. Video shows a weaver weaving the textiles, that form the textile part of the installation. The weaver uses Stepping Reed (a tool invented by Kadi Pajupuu). The rhythmic movement of weaving melts into a scene of two dancing kids, that change places like warp and weft. Nostalgic atmosphere is stressed with the sound of migrating birds.